Let’s Get to Know … Bill Lamensdorf! Nine years ago, Bill Lamensdorf began running to improve his health and lose weight. Today, he’s a marathon machine, running the distance several times each year. To date, he’s run 23 marathons. Great advice, Bill! Read on to learn more about how he got started, his favorite workout and his must-run local races. Favorite Gear: My glow-in-the-dark shirts from when I paced the Rock ‘n Sole Half Marathon twice. They can be seen whether it’s dark, cloudy or foggy, and they are very comfortable. Pre-race routine: Make sure I eat a big bowl of old-fashioned oatmeal with almonds or walnuts in it about 3 hours before the race. Favorite post-marathon treat: Anything I don’t normally eat on a regular basis, such as pizza, a burger or ice cream. It’s one of the only times of the year I eat these foods. Favorite distance to race: The marathon. Although I’ve run 23 marathons, they are still very challenging, and the feeling of accomplishment afterward is incredible. Dream race: Big Sur International Marathon in California. The course is from Big Sur to Carmel on scenic Highway One. It is considered to be one of the most breathtaking courses in the world. There is a non-guaranteed drawing to gain acceptance in the race since it is in such high demand. Why did you start running and what’s kept you going? 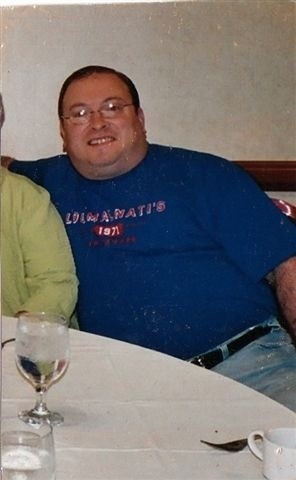 I started running when I was 70 pounds overweight almost 10 years ago. My first run ever I ran a half mile without stopping and almost passed out, LOL. It took me one year to lose those 70 pounds through healthy eating and exercise. During that year of weight loss, I tried every form of exercise imaginable. It was then that I fell in love with running. I have continued to run over the last 9+ years to keep the weight off and I love the challenge running gives me. My changes were not completely by choice. I was forced to become healthy or face the consequences of a sedentary lifestyle. About 10 years ago, I was feeling very ill much of the time, which prompted me to go to the doctor. Keep in mind I was 70 pounds overweight and certainly not a healthy eater by any means. My doctor ordered a complete set of blood work. I was diagnosed with fatty liver disease, high blood pressure, high cholesterol, elevated sugar levels and pre-diabetes. My doctor gave me an ultimatum: get put on a myriad of prescription medicines or lose weight through diet and exercise. I felt this was my wake up call. So I started exercising and eating healthy, while also doing a lot of research on the topics. To make a long story short, once I lost 45 pounds, all of my blood levels went back to the normal range, and the fatty liver disease completely healed itself. But I did not want to stop there, so I kept going and lost the full 70 pounds. It has not been easy to keep the weight off. The experts say that 95% of those that lose weight gain it back. But with the help of the Lord, I have kept the majority of it off. My training weeks vary. This year I am averaging about 35 miles a week and training for my 24th marathon, which will be my 3rd marathon this year. In past years, I ran as much as 50 miles a week every week, but I am now working 45-50 hours a week, which makes it difficult to put in the high miles. Throughout my nine-year running career, my biggest week of running was 80 miles about six years ago. I felt like I was running in my sleep that week, LOL. But it was a lot of fun! Can you tell us about your favorite workout? My favorite workout is a hill/interval workout. I begin a little north of the War Memorial on Lake Drive in Milwaukee. I run on Lake Drive north to the Lafayette Hill and run up and down that hill. I continue running north to the hill on North Ave, and run up and down that hill. My run keeps going north on Lake Drive. The next hill I come to is the hill going up to Lake Park. I run up and down this hill. I continue north on Lake Drive and run up the big hill in front of the polo range. I then turn around and repeat the exact route on the way back to the War Memorial. This ends up being a run of anywhere from 6-9 miles, but it really feels like 10-15 miles because it is such a difficult workout. What running goals are you looking to tackle next? I have a few goals I’d like to accomplish in the near future. I look forward to hitting the 30-marathon completion mark, which should be in a few years, Lord willing! And then eventually I want to train for and run a 50 mile or 100 mile ultra-marathon. What prompted you to work with a running coach and how have you benefitted? I am currently being coached by Richard Dodd from Running’s RAD. I worked with a personal trainer for the last nine years. The trainer helped me to lose the weight and keep it off, in addition to helping me become a regular runner. But at the urging of my trainer, I sought out a coach last spring and began working with Richard. The best part of working with Richard is that he is a tenured and accomplished runner, so he understands my lifestyle. He also is an ear for me to bounce things off of and get advice. Additionally, Richard runs with me periodically and we talk about strategies and goals. 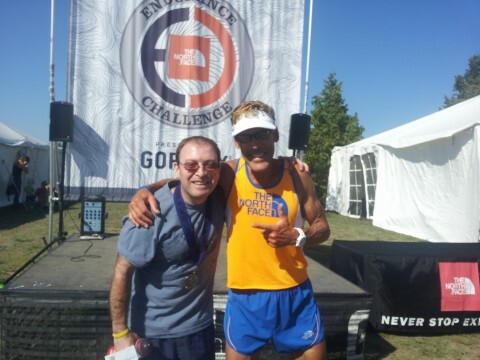 Richard helped me get my best time in 2 years at the marathon I ran six weeks ago. I prefer running right out the front door of my house. I am a morning person, so I do most of my runs early in the morning when it is still dark outside. Therefore, it is very important that I run on a road with wide shoulders. Fortunately there is a street two minutes from my house that has very wide shoulders for a good eight miles each way, allowing me to do up to 16 miles on the road. I also like running long distances on the Loomis Road / HWY 36 trail. I like how the limestone gravel trail is easier on the feet and legs, and this route enables me to go as far as I need, since it is a very long trail. 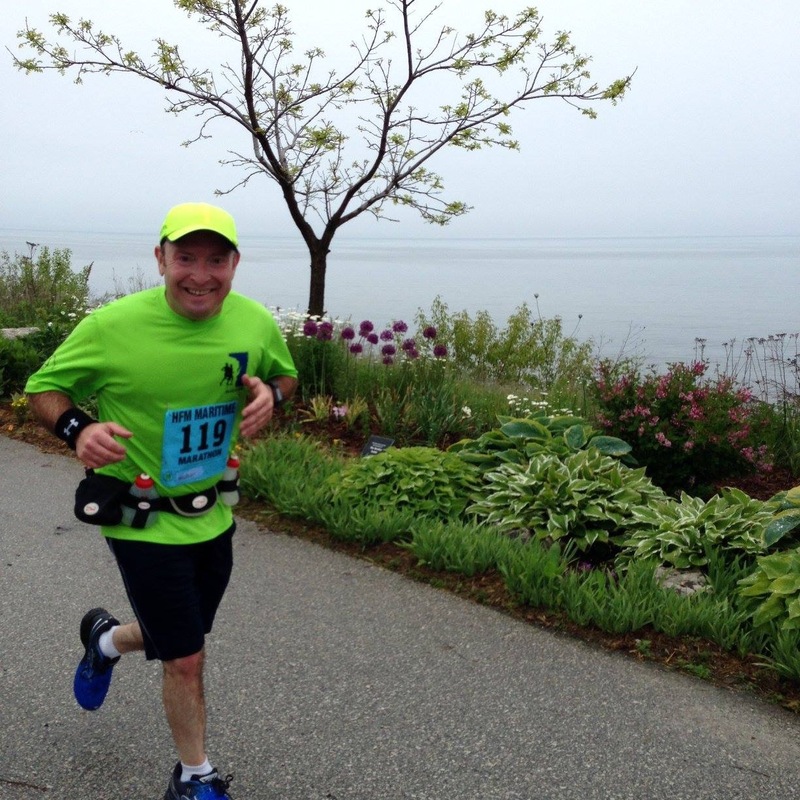 One of my favorite races is the Wisconsin Marathon in Kenosha. This is due to the fact that I raced my PR on this course. I also love the HFM Maritime Marathon in Manitowoc because it is a great course, primarily run on the lakefront in Manitowoc and Two Rivers, WI. I also love the Milwaukee Lakefront Discovery Run in the fall. It’s a 15K no-nonsense course along the east side of Milwaukee. My all-time favorite race is the Running with The Angel Marathon in the Mohave Desert in Nevada, which I ran about 6 years ago. It is one of the hilliest marathons in the county. But it is also unique in that it is the exact course of the Running with The Devil Marathon in the middle of summer. This is the name of the race in the summer because it is one of the hottest places in America at that time. The Angel race is on the exact same course, but in January. BTW, I have no desire to run the Devil race in the middle of summer, LOL. 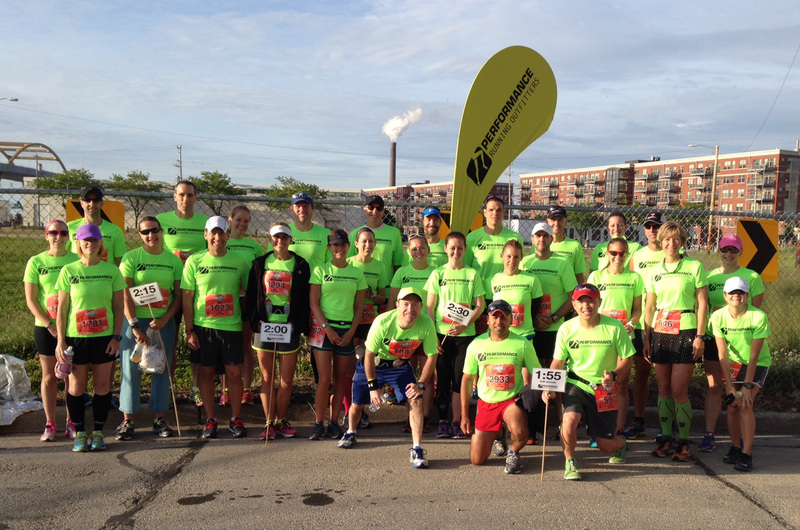 We have become a very active town, and we actually have a large running community in the Milwaukee area. Fellow runners in Milwaukee tend to support each other very well, especially on social media. Thanks for chatting with us, Bill! This entry was posted in MKE Runners and tagged Bill Lamensdorf, MKE Runners, Richard Dodd, Running in MKE, Running's Rad. Bookmark the permalink. ← Let’s Get to Know … Christina Grimord!